"Happy Monday! I hope you had an amazing weekend! As always I like to start the week of right with some words of motivation…. 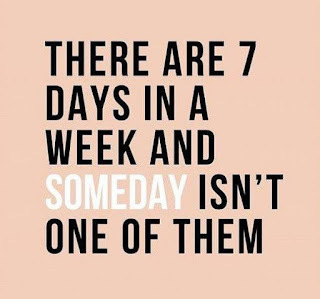 "There are 7 Days In a Week and Someday isn't one of them"
Someday will never come if we do not start taking action now! Make today be the day that you start creating the life you know you truly want and deserve! Do not let yourself get discouraged… it is not about hitting home runs but instead each day getting on base… each day work to be one step closer… and eventually you will have made it! For the past two years we have had the pleasure of matching thousands of customers like you with great Realtors throughout the country. As a result of your support, Zoocasa has grown into a unique business in a traditional space. Although we have had great success, we have made the difficult decision to close down our business. If you have entered into a Zoocasa Customer Rebate Agreement, this email is notice of termination of such Customer Rebate Agreement effective June 22, 2015. Zoocasa will honor rebates for transactions that go firm (no conditions) on or before June 22, 2015. Your deal can close any time before or after June 22, 2015 and you will still qualify for the rebate, as long as your deal was firm, and we receive the paperwork, on or before June 22, 2015. After June 22, 2015, the brokerage will cease to be registered and will be prohibited from trading in real estate as a brokerage. Click HERE for frequently asked questions outlining further clarifications and procedures regarding rebates. We would like to thank you for supporting us over the years and wish you the best in achieving your home buying and selling goals. The Fire Marshal's Public Fire Safety Council and Enbridge Gas Distribution announced Selwyn Fire Department was one of 20 fire departments to receive a $5000 training credit at the Councils Distribution Centre to purchase fire fighting training materials. The total fund must be used by December 31/2015 or the funds will be directed back to the Council. The Selwyn Fire Department's FPO, Howard Jinkerson applied for the donation. Great job Howard! Always remember "A journey of a thousand miles begins with a single step"! The time is going to pass anyways.... start taking your first step now! Life is way too short.... it is up to you and only you to make your dreams a reality, the only way that will ever happen is to take that first step.... to start taking action! Start today, start now.... let today be the day where your life changes forever!